Home > News > Announcements > An Australian First! 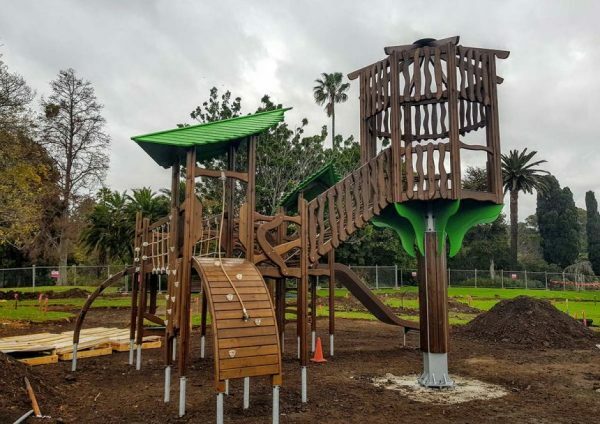 Australia’s first installation of the Lappset Robin Hood Treehouse from the Lappset Flora Nature Play series is currently underway at Footscray Park, located on the south bank of the Maribyrnong River. The new playspace is set amongst the almost 15 hectare Park, which provides views to the city skyline, Flemington Racecourse and connections to the Maribyrnong River Trail. Footscray Park has the most intact Edwardian period public garden in Victoria. The Park was designed by noted architect Rodney Alsop, who won a competition for its design in 1911. These plans were implemented by Superintendent David Mathews, from 1916 to 1964. The park contains a memorial garden for soldiers who served in World War I and World War II as well as a memorial to the poet Henry Lawson. This innovative and custom designed Treehouse is ideal for children from 2 years and up and includes lots of challenging balancing and climbing elements for older kids too. The Treehouse has a large boutique stainless steel slide from our German Partner Spiel-Bau, which took coordination and cooperation to marry up the custom equipment from our two suppliers. The Treehouse is made up of Nordic Pine, HPL and steel reinforced rope. The Treehouse is the largest Flora Nature Play design to have been installed globally – there is more to come though! Playspace design by Justin Staggard and Ric McConaghy and Maribyrnong City Council in consultation with the Lappset MyDesign Team.